The flagship store of Clémence opened in Taikoo Shing which is the first brand rue Madame Fashion Group has developed. Walking through our store is an inspiring journey, you will never know what you’re going to discover! It is also an intimate experience through exchanging ideas with our friendly team, who appreciate fashion just as much as you do! The Clémence woman is no typical “Parisienne. In fact, she thinks the conventional definition of a Parisienne is too cliché. She is a Parisienne at heart – sensual and sensible, intuitive and intelligent and has that certain “je ne sais quoi”. A feminine feminist. Fashion is a medium to express her unique personality and enrich her multifaceted life. She always finds joie de vivre in her daily life. 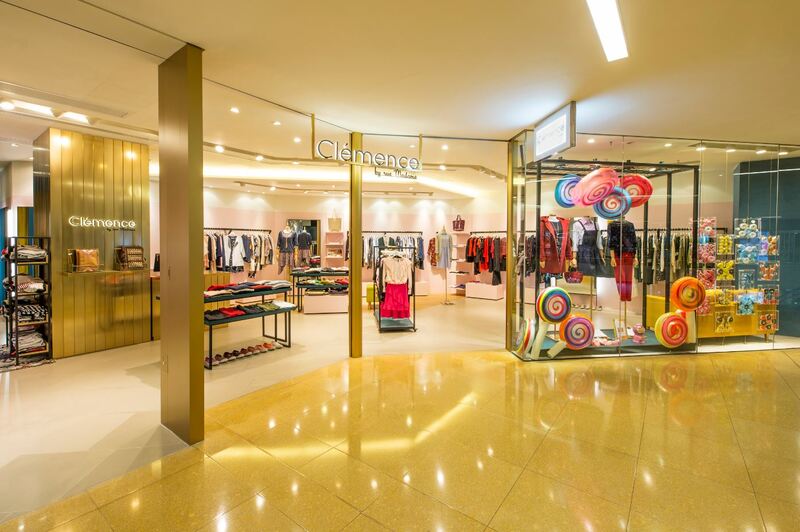 The store covers 835 square feet that the interior of the Clémence by rue Madame store evokes a warm and welcoming atmosphere with a dash of modernity by juxtaposing different materials. Sleek wooden floor with brass and black metal work stands in stark contrast to the luscious velvet furnishings. The blush pink wall under the mood-lifting lighting adds a soft glow to the bright and spacious layout, it is also in harmony with the teal wooden shelves and clothes racks. This richly textured minimalism provides the perfect backdrop to showcase our ever-changing styles, fun and feminine designs.